However, to be as reductive as possible of 2001 in order to keep this review Solaris focused, Kubrick’s film approaches knowledge from a view that equates it completely with power and advancement. 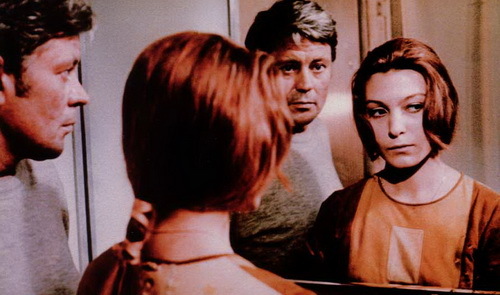 Solaris is a far more skeptical film and poses many epistemological questions all the way to whether knowledge can ever truly be attained. It is with this central conceit that the trappings of the genre nearly become ironic, with our apparent “advancement” mocking us by only creating more questions or failing to answer the ones that really matter to us. The characters are largely used as puppets for Tarkovsky’s philosophical interests. One man represents the constraints that science can place on the concept of knowledge in it’s attempt to reduce phenomena to its basic terms, another represents becoming lost and surrendering to the unknown, while our protagonist, Kris, struggles to find some ground in between. This is perhaps the most unsuccessful aspect of the film (the other is in its occasionally drawn out editing) as occasionally it leads to a film bursting at the seems with ideas it wants to express and doesn’t have the confidence to illustrate them to the audience any other way besides having the characters pontificate and opine. I’ll call this Nolan-syndrome. This issue seems to be incongruous with the rest of the film which illustrates a highly refined sense of visual language through metaphor or perspective. When Tarkovsky allows the dialogue to pertain to the more character motivated aspects and let the visuals tell the story, the film soars. One of the defining visual messages within the film is the way it treats its characters and events as ephimeral and insignificant within the greater scheme of the universe. This is conveyed with frequency through images of moving water be it a stream, the oceans of the planet Solaris, a shower, or a leaky roof. Movement is a defining aspect of the film. I was particularly struck by how Tarkovsky captured the illusion of a wider world by demonstrating the perspective failings of the camera. At complete odds with convention, character move about while the camera is away and float in and out of our view, rarely coming from an expected position. This all at once captures the very essence of the film in a simple visual manner: We can see so little of this world that we can’t even see when someone moves around within a small room, how can we ever expect to understand its secrets in full? The final image compounds this, illustrating the isolation of the human condition in a vast ever changing world (see how I still didn’t spoil things? Booyah!). Also, along this train of thought, one of the paintings shown briefly is The Fall of Icarus. It’s a particularly lovely landscape painting that depicts a vibrant busy city at the edge of the sea. Farmers, ships, dock workers, animals, everything is vibrant with life and yet somewhere in that ocean is a single leg protruding where Icarus has fallen, insignificantly and completely without being noticed. This painting is on screen for only a few moments and one would have to know it to recognize it but this attention to detail is what makes Tarkovsky’s message of being lost in complexity so perfect. In keeping with the deeply philosophical nature, the film even begins to visually emulate Plato’s Allegory of the Cave towards the end by blinding the protagonists and placing him in genuine physical discomfort when he begins to near a “truth” and step outside himself. It also questions external consciousness through its plot. Are these “visitors” true manifestations with thoughts and emotions or simply projected creations from our psyches? Is loving another simply loving ourselves? Early in this thread, someone described Tarkovsky’s films as spiritual but I disagree, at least in regards to this film. Existential and philosophical are what this film screams to me with every scene but then I wonder, what is a “spiritual” film? Is there a difference between the spiritual and the existential? Does the spiritual necessitate the preclusion of a deity? If so, then I’m completely at odds with referring to the film as such. Regardless, the film is a fantastic example of how the medium works as a way of communicating a plethora of ideas through various ways simultaneously. By doing so, the film nearly adds a later of metafiction on the manner. In its ponderings about how man “needs a mirror”, and frequently uses mirrors throughout, it declares itself a mirror to our world. A way of looking within. This is simply a drop in the ocean of the complexities that this film offers and if it is a mirror, I’m willing to bet each of us sees something different when we look in. This entry was posted in Drama, Sci-Fi & Fantasy. Bookmark the permalink.